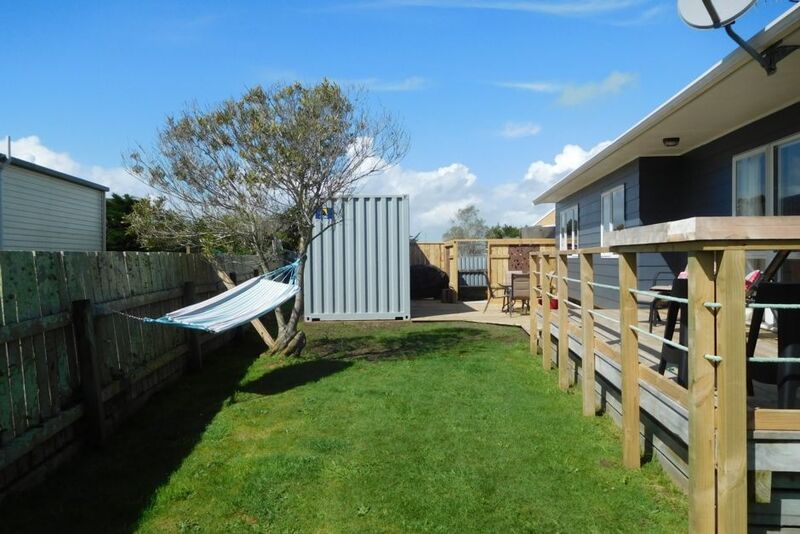 Well kitted out property with kitchen ideal for home cooking, washing machine, heat pump, TV and internet, games, books, and a sleepout which leads out onto the large deck. Outdoor bar area, BBQ and good range of outdoor furniture (including relaxing hammock and beach windbreaks) to make the most of your summer break. There is also a high chair and portable cot that can be provided on request. Fully fenced pet friendly property. Please let us know if you are bringing a pet. Had a great time away in a nice, warm, clean and tidy property. Good communication with owner and well furnished house. We had a great time. This house had everything and was comfortable and clean in a great spot. Thanks to Kerry for great communication and lovely welcome basket. Lovely, warm and friendly. Best of all our dog was welcome! We asked Kerry at very short notice and she was kind enough to help us out. We thoroughly enjoyed our stay and the bach had everything we needed, including Netflix for the kids. A sunny, happy vibe close to the beach (Foxton Beach is stunning!). Everything was very clean and tidy and comfortable too. All the bedding was fresh and we all had a great nights sleep. It was a really lovely stay. We’ve had such a nice time these past 5 days. It’s been very hot, but the house was so comfortable with the air conditioning we hardly noticed. This property has everything you could need. It was very clean and tidy and modern. We are very keen to return soon. Thanks so much for letting us stay!